Today i returned to work after a few weeks away due to summer school, job training, Japanese language class and taking summer leave. 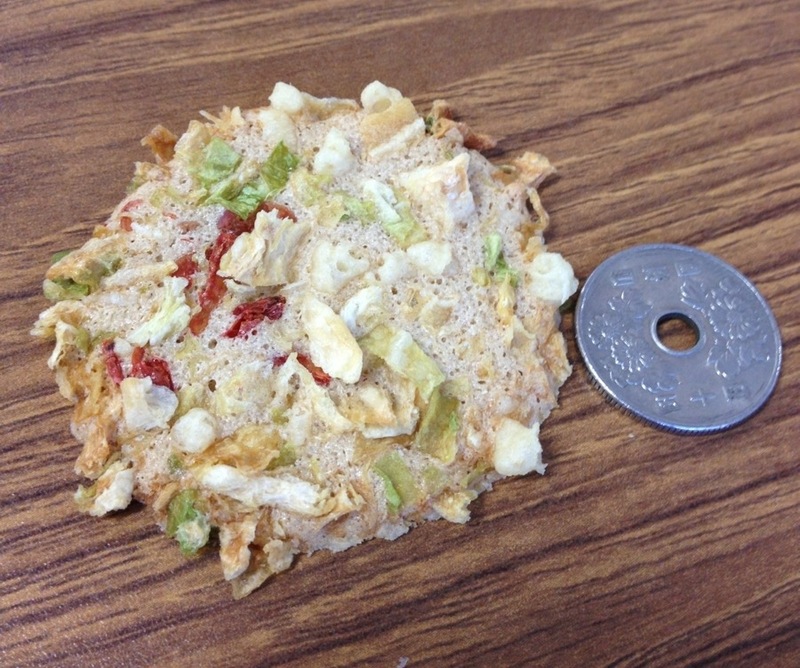 To my delight was met with a pile of snacks on my desk from my co-workers. 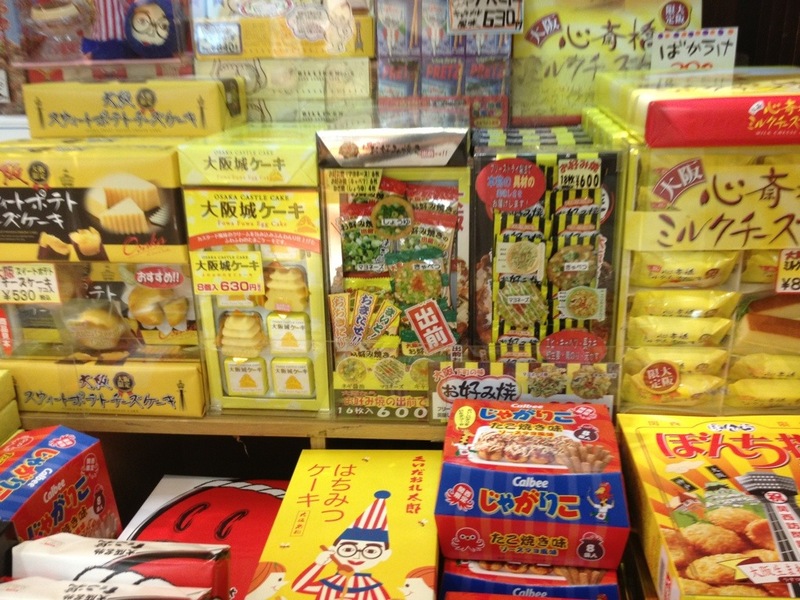 In Japan it’s customary to purchase omiyage お土産 (souvenirs) for friends, family and co-workers for a wide array of circumstances that I’m not going to into in this post. 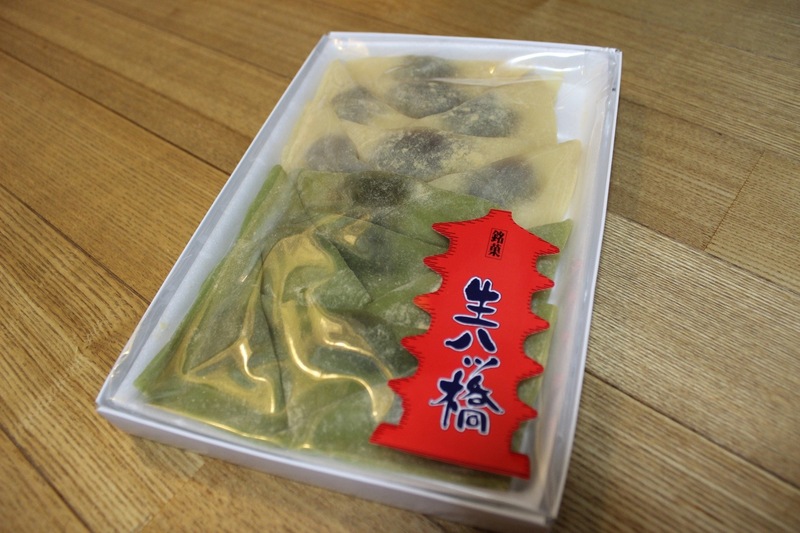 The one I will be referring to us associated with travel, returning to work after taking a trip it is expected that one will bring his/her coworkers a present from their holiday destination (called meibutsu 名物 – literally regional produce). 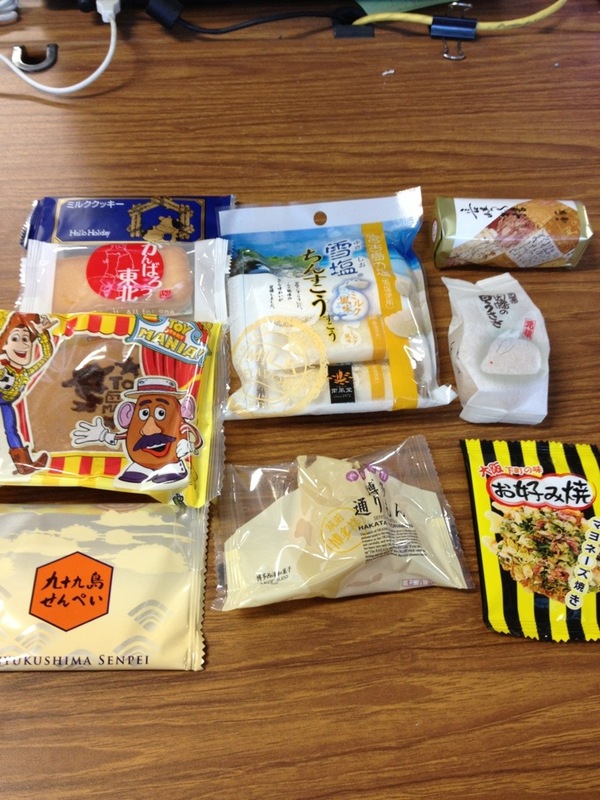 There is a wide array of rules that come along with this, omiyage must be individually wrapped, packaged attractively and ideally be something that can be consumed. Now being gaijin I’m pretty much except from the rules of omiyage as its presumed that the average foreigner is completely oblivious of all Japanese customs. 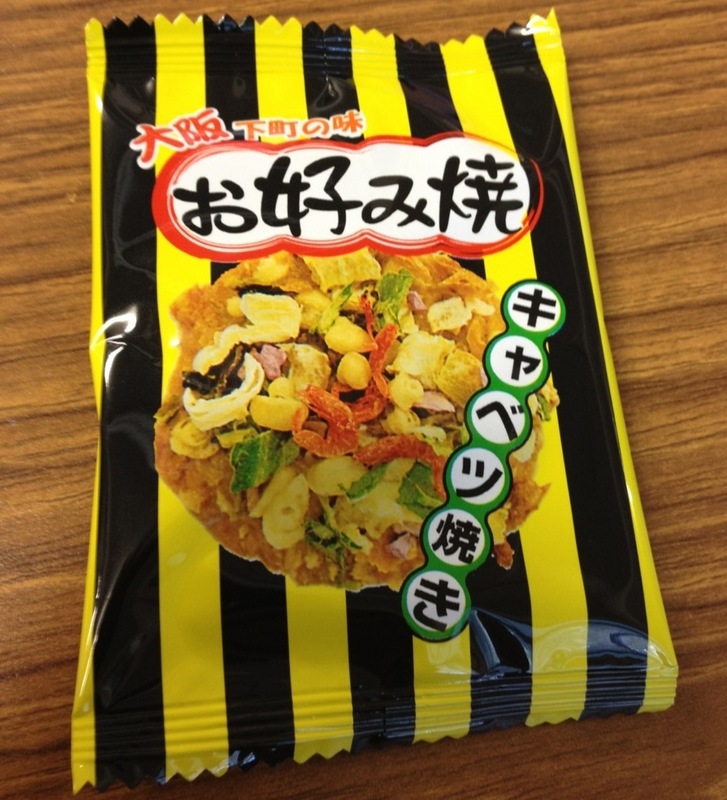 I however like to make a little effort and since I spent the last few weeks either on shuchou (business trips) or sitting at my desk doing nothing I bought my co-workers some okonomiyaki senbei お好み焼き 煎餅(japanese savory pancake themed rice crackers) from one of my many visits to Osaka in the past few weeks, which they are famous for. That said, my little omiyage was pale in comparison to the mass of them that had piled up on my desk during my absence over the past 3 weeks. 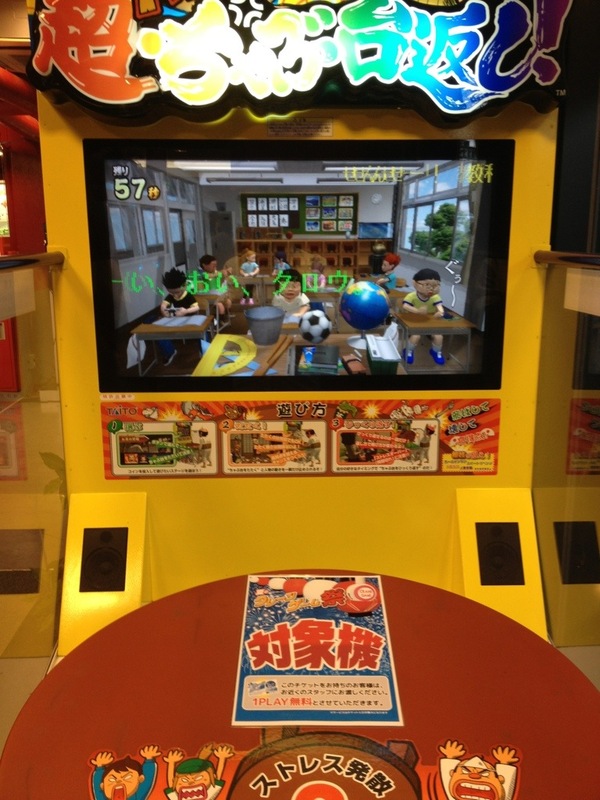 Basically ‘Chabudai Gaeshi’ is a Japanese phrase meaning to flip the chabudai (Japanese style table). Literally, it describes the act of violently upending a chabudai as an expression of anger, frustration, and disapproval. Of course the Japanese can make a video game out of pretty much anything so Cho Chabudai Gaeshi found its way into existence. 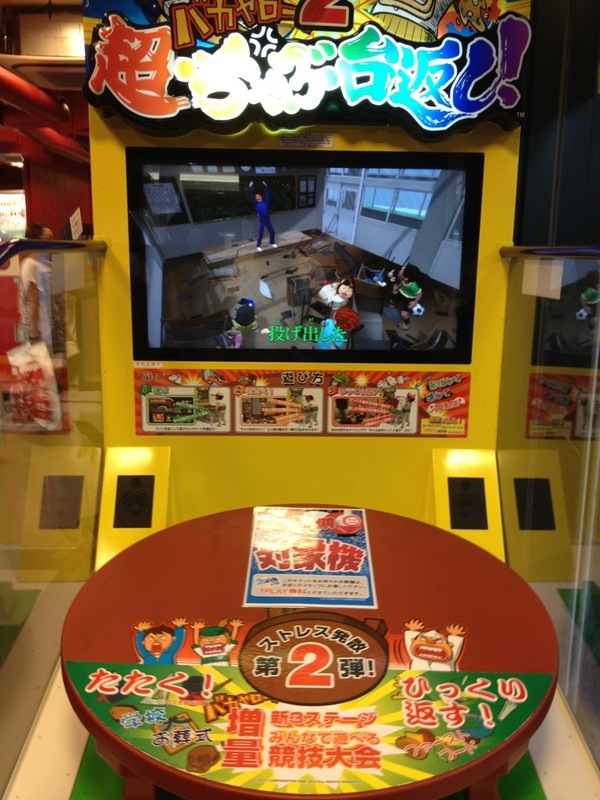 Basically the player finds himself seated at a table in a frustrating situation, the objective being to progressively bang the table harder and harder when provoked by characters in the game before loosing your cool and flipping the table. Players can pick from a wide variety of environments including an office, wedding or family dinner. As I’m an English teacher I felt obliged to pick the shougakko class, as being frustrated by small children seems to be my forte. I must say it was somewhat satisfying to see the students pawned by a flying table in slow motion after I lost my cool and ‘got my flip on’! 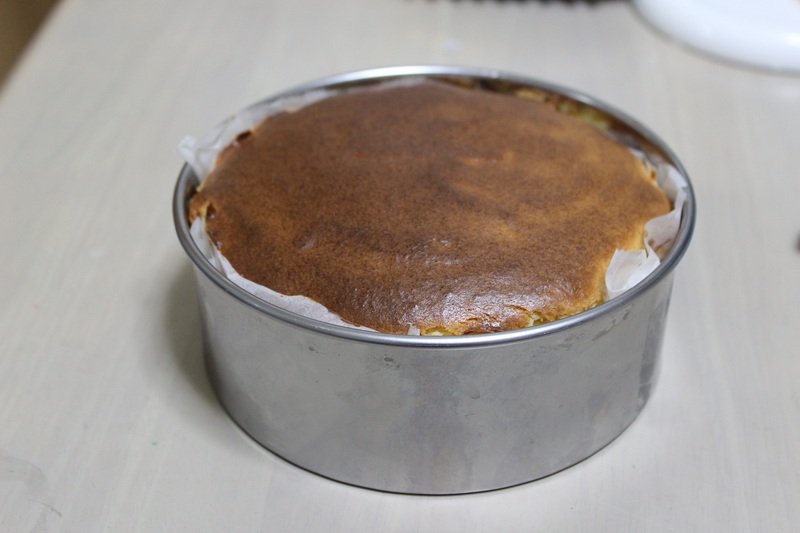 Shortly after arriving in Japan almost 3 months ago I acquired a convection oven as I am quite the baking enthusiast. Unfortunately by western standard the Japanese just really don’t seem to know what an oven is which is why the ‘oven’ I purchased is nothing more than a glorified microwave. 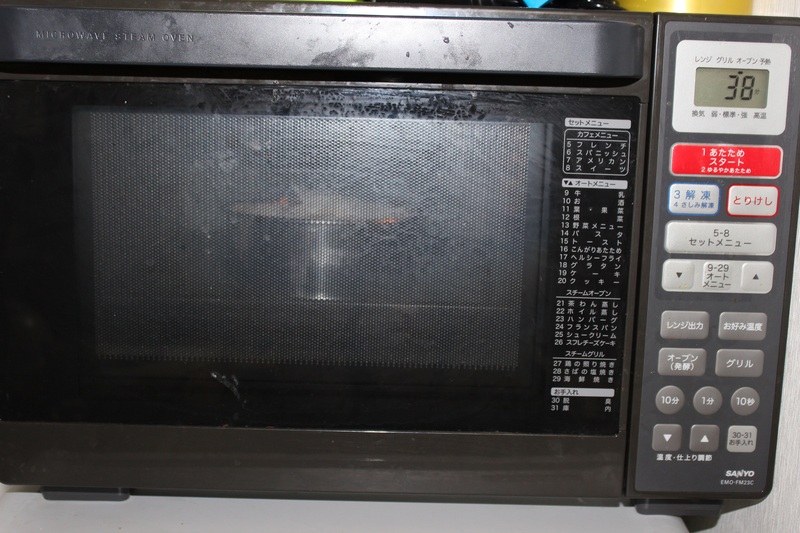 Despite the plethora of settings and modes it comes equip with (33 in total, everything from steaming fish to warming sake) the only ones I really use are the oven, microwave and grill. This however is mostly due to the fact all the buttons are in Japanese and I’m fairly poor at kanji. 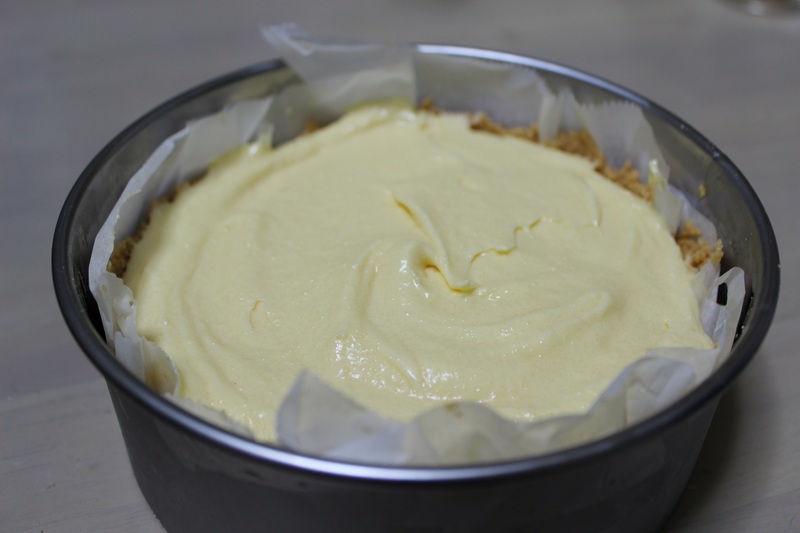 Anyhow this evening once overcoming the hurdles associated with purchasing all the necessary ingredients (mostly financial), I decided to try my hand at baking a cheesecake as I had been given some home made cookie crumbs by a departing JET. 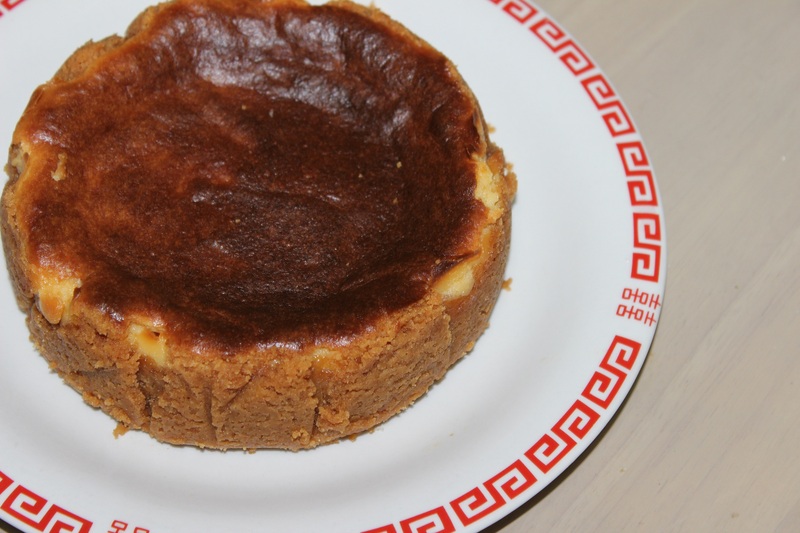 Now despite undertaking a few ambitious baking exploits in the past never had I deluged into the realm of cheesecakes so this was quite the experiment on my part. Now one thing you will notice about the photos is the pan I used is meccha tiny, this is largely a reflection on the size of Japanese ovens, however the difficulty it presented to me was that all the recipes I came across upon searching were for much larger batches. Alas I took it upon myself to simply ‘wing it’ and see where my baking adventures would take me. The following is the recipe I ended up going with. Alas the following is the final product, lets just say it was very rich and tasty. As testament to this last Thursday I had 5 friends over to ‘taste test’ my baking exploits and they returned with positive feedback, the consensus being that it tasted like the milky candies. 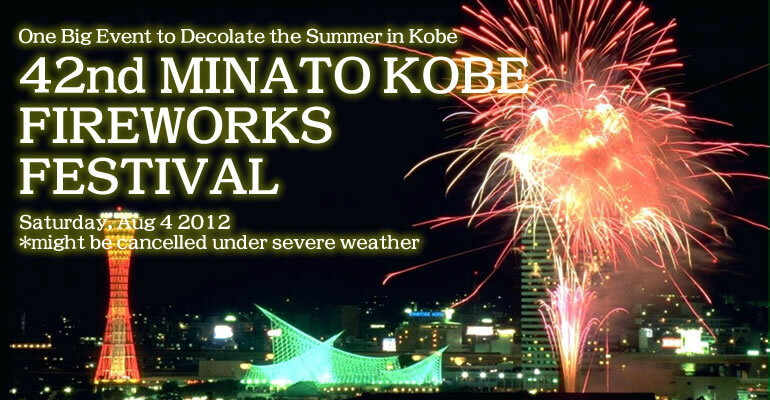 Last Saturday Evening was the 42nd Kobe Minato Hanabi Matsuri (港神戸花火大会), the largest fireworks display in Kobe throughout the year. 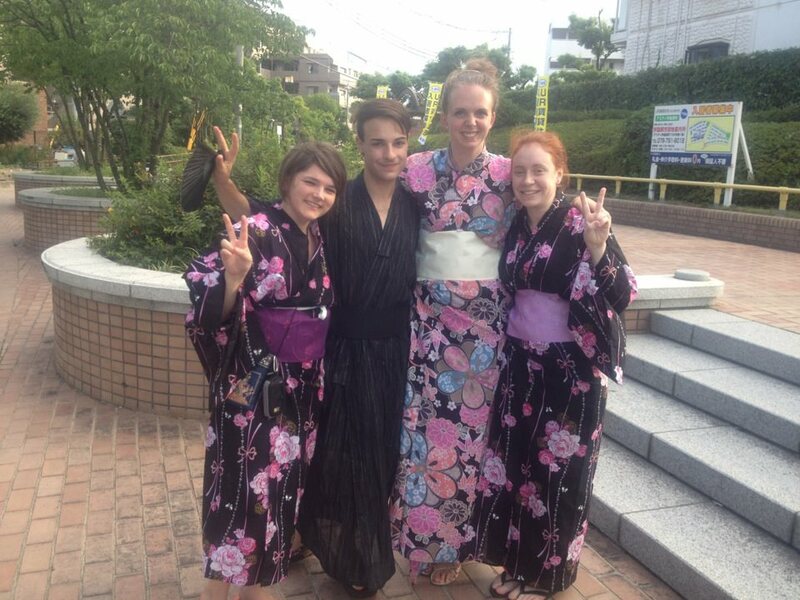 Being the charitable lad that i am(read: who wouldn’t want an entourage of yukata clad babes) I took a couple of the new Aussie girls yukata 浴衣 (a light summer version of a kimono) shopping the evening prior, and so donning our most babin threads we hitt the town on a shouchu/takoyaki fuelled adventure. 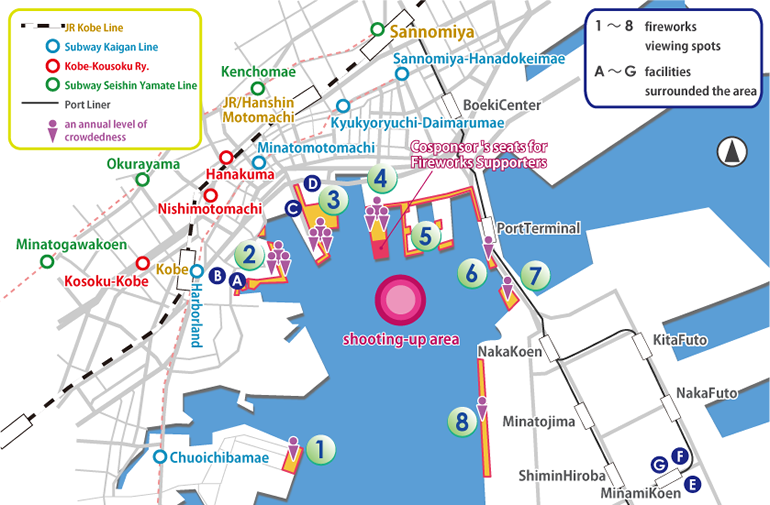 This was the festival map for the evening and this little engrish gem I found really amusing. Lets Just say ‘shooting-up area’ back home is generally found at 3am in a McDonalds bathroom. 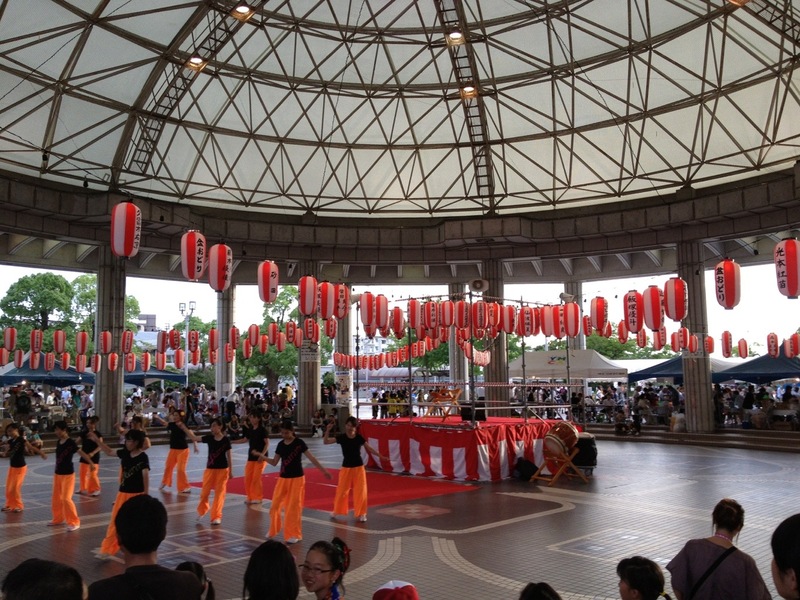 On our way to Harborland we stumbled upon a small matsuri that was happening in front of Campus Square (crazy as this is like 300m from most JETs who live in Gakuentoshi’s front door). Although quaint in size the Matsuri 祭(Japanese festival) boasted many performances and cheap food stalls (half the price they usually are at matsuri) and kids festival games. 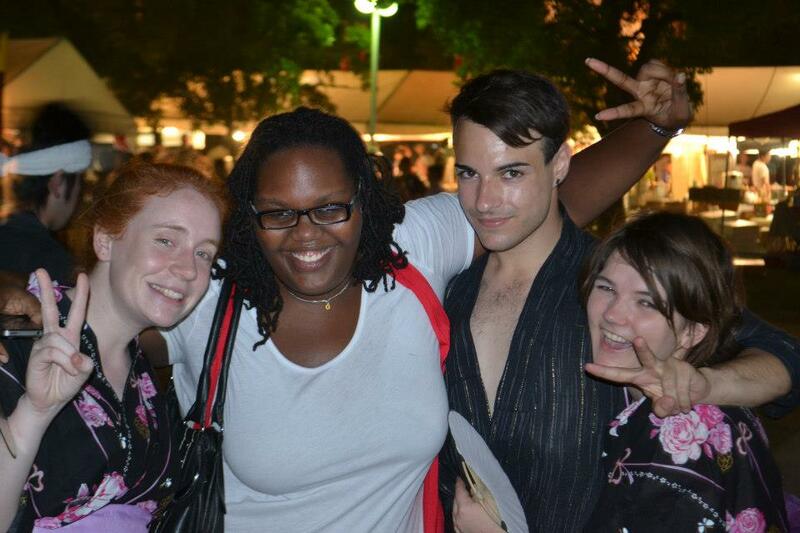 The 4 of us being the only gaijin there and all of us wearing yukata needless to say we got many stares. 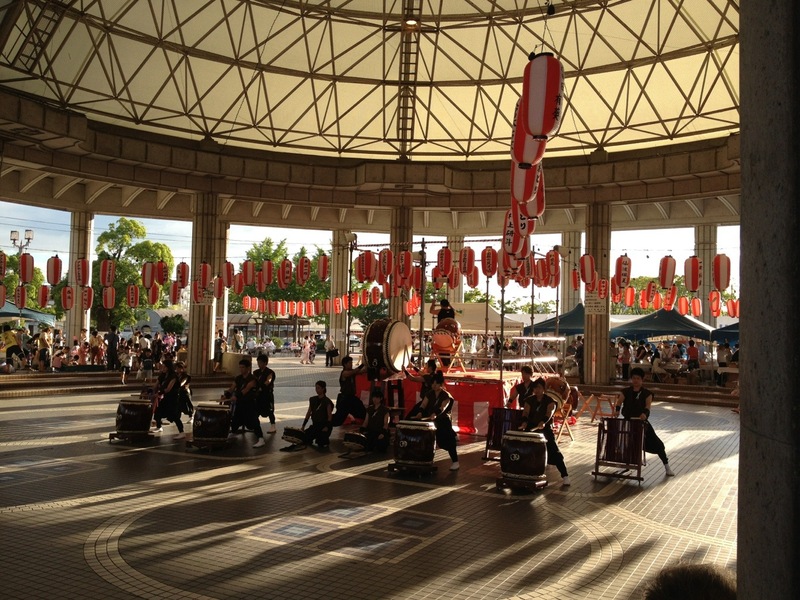 One event I was meccha impressed by was the Taiko performance, these guys were intense!! 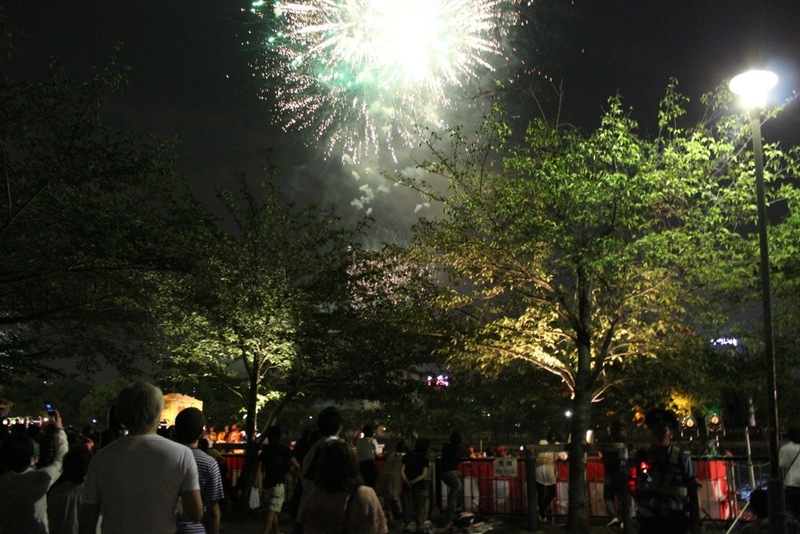 Anyhow we eventually escaped the lure of cheap Takoyaki/Karage and embarked on a misadventurous journey to Harborland where the Hanabi were happening in the bay. Now this is my 3rd matsuri in as many weeks, however my first in Kobe, one thing I have noticed that is applicable to all of them thus far, is that your phone will become as useful as a paperweight once you arrive. The mobile phone networks are simply not built to handle the sheer volume of people that flood an area during a major (this was one) matsuri, think 100,000s-1,000,000 people. 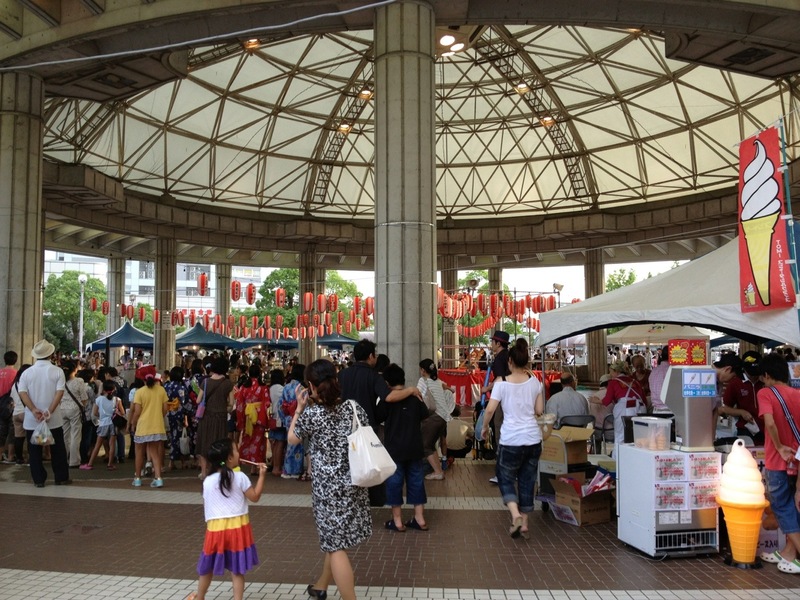 Alas if your reading this and ever considering attending a matsuri MEET YOUR FRIENDS PRIOR TO ARRIVING! We spent a good hour looking for our friends who we knew were within a 100m radius of us but were all but lost in the crowds. 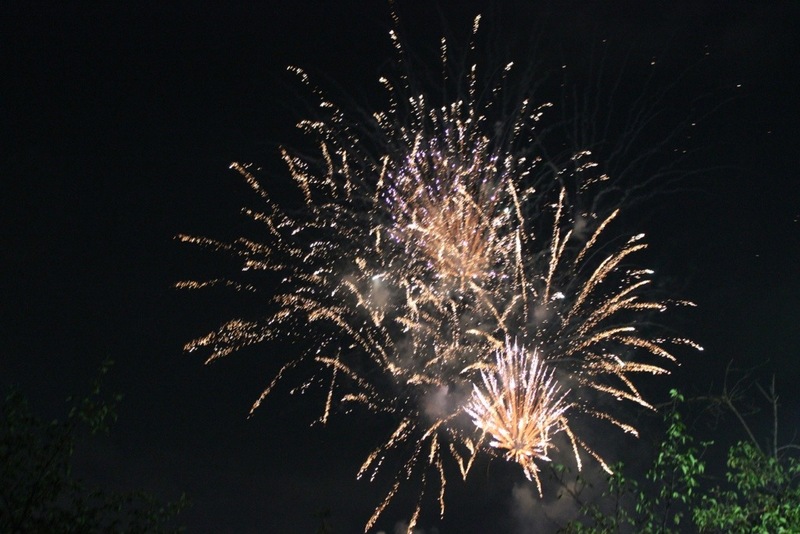 After resigning all hope of uniting with the other group we decided to simply get in on the typical matsuri festivities, drinking too much, eating crazy festival foods and watching the Hanabi 花火 (fireworks). 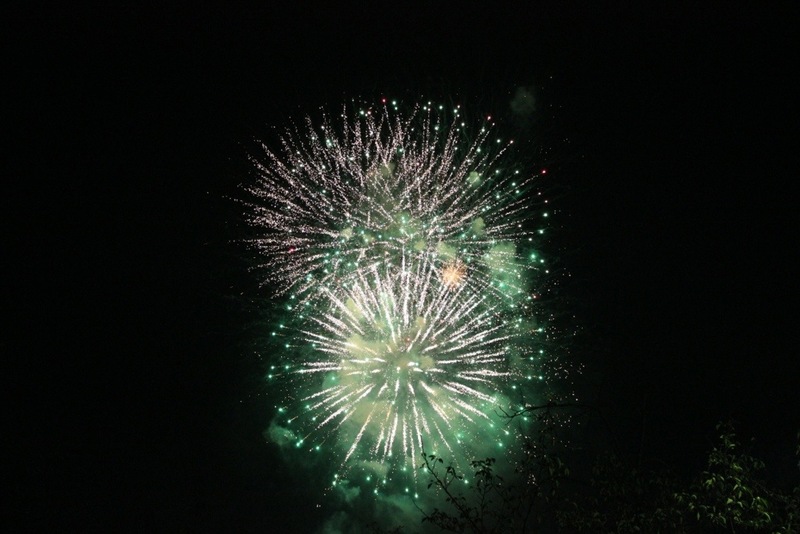 So tsuyu 梅雨 (rainy season) has come and gone and natsu 夏 (summer) is upon us in Japan. 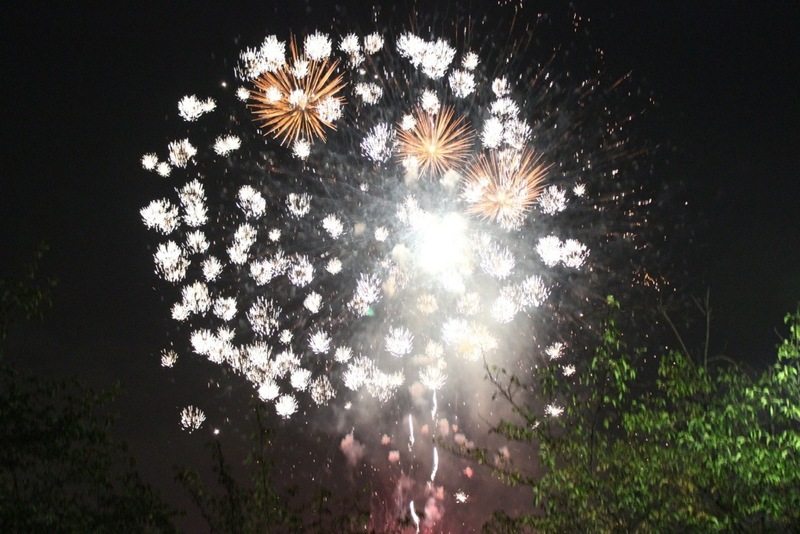 For both students and teachers, summer holidays mean something very different than their western counterpart. This is in the same vein of thinking of how the Japanese seem to love to work 4 hours of overtime everyday and work the weekends. Thus in Japan all teachers and most students attend school on a daily basis even during summer break! At my JHS which students come to school for half days either in the morning or afternoon to train with their respective clubs. The teachers tend to spend half a day supervising club activities and the other half siting in front of their computers repetitively fanning themselves and mumbling atsu atsu (its hot), I presume this is what they regard as junbi 準備 (preparation time). Fortunately as the token gaijin I’m pretty much exempt from working such ridiculous hours if I don’t want too. That said I regard the opportunity to watch my students sports club tournaments on a Saturday more of a perk of the job than a chore. 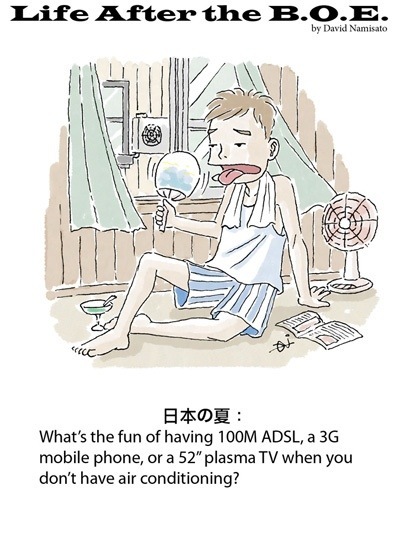 However it does mean that during the summer there are several thousand ALTs across Japan, that find themselves sitting at work awkwardly twiddling their fingers for a couple months with nothing to do. 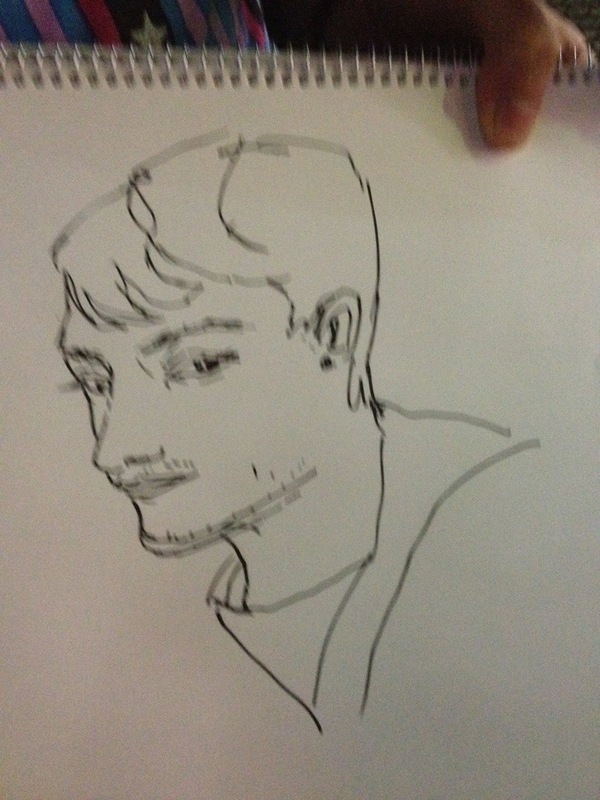 Now I think I’m particularly fortunate, as I work at a school where I can do pretty much anything I want. No matter how crazy they are my ideas are, they have yet to be shot down! My OTEs (other teachers of english) have been nothing but amazing at accommodating my imagination, which has a tendency to run wild at times. In addition as one of my OTEs is in charge of the kendo club I have been watching them practice often and training with the ichi-nen sei on a daily basis. God I now understand how Japanese people are so skinny, these kids do like intense workouts for 4 hours a day on the school holidays! It’s actually really fun training with the kids as it gives me a chance to interact with them in a situation were we are equals instead of sensei 先生 (teacher) and chuugakusei 中学生 (student). 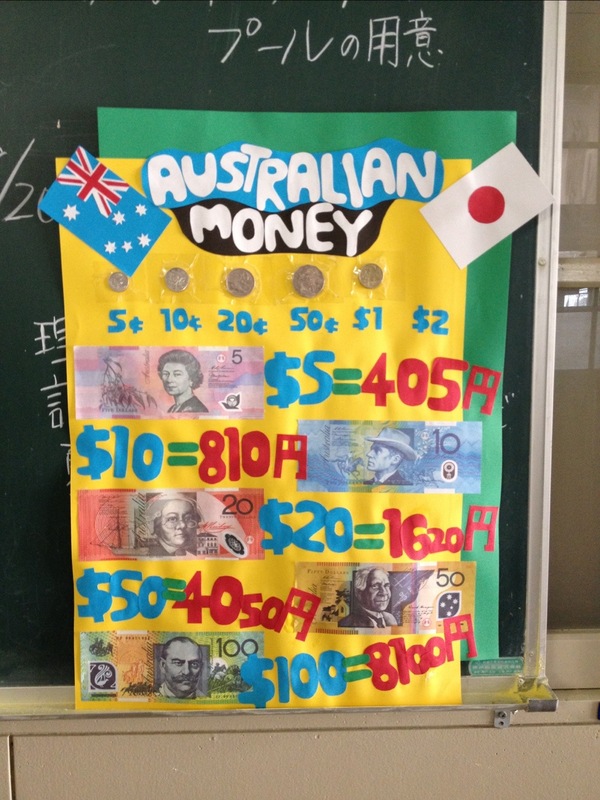 Last week I spent had the week designing Halloween lessons and then 2 days making this epic Australian money poster. This week I’v shifted my ambitions to claiming some wall space in one of the hallways to make an ‘English wall’, to aid in such a pursuit I have recruited half the members of the kendo club to aid me in some arts and craft! Alas after raiding the stationary room I have been teaching aboriginal dot art, having students create me a giant collage in the shape of Australia and decorating didgeridoo’s. Still at the end of the day I’m not complaining, I am rather enjoying all the free time that has been thrust upon me after having such a busy first 2 months. 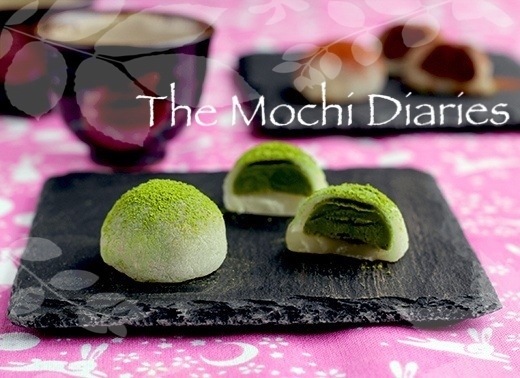 Today I shall be introducing the original mochi that began my infatuation many years ago during a trip to Kyoto!! Without further a due I present my holy grail of mochi the triangular, deviously delicious Nama Yatsuhashi 生八つ橋!!!! 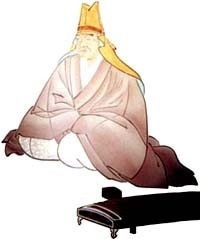 Four years after his death in 1685 a vendor near Shogoin Taisha began selling a sweet that was shaped like a koto in his memory. 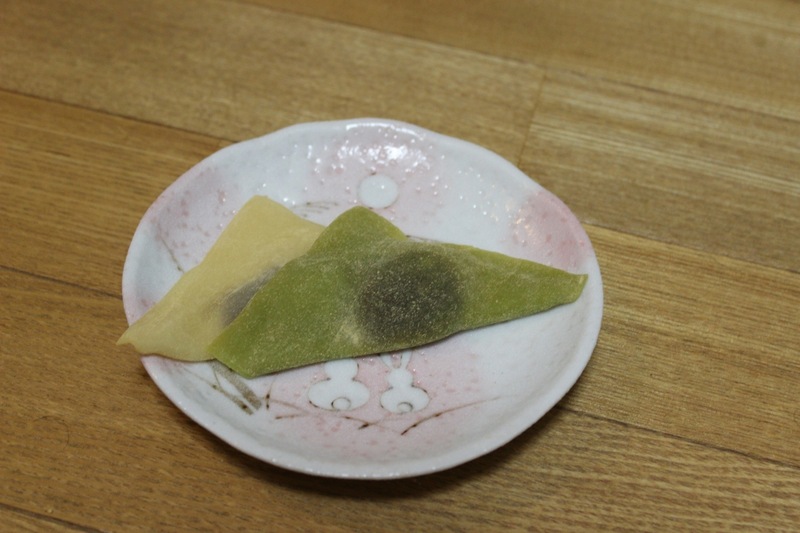 By the turn of the 20th century Yatsuhashi began to become popular as an omiyage gift from Kyoto, since as a baked cookie with ingredients composing of only pounded rice, cinnamon and sugar, it has a very long shelf life of around 3 months. 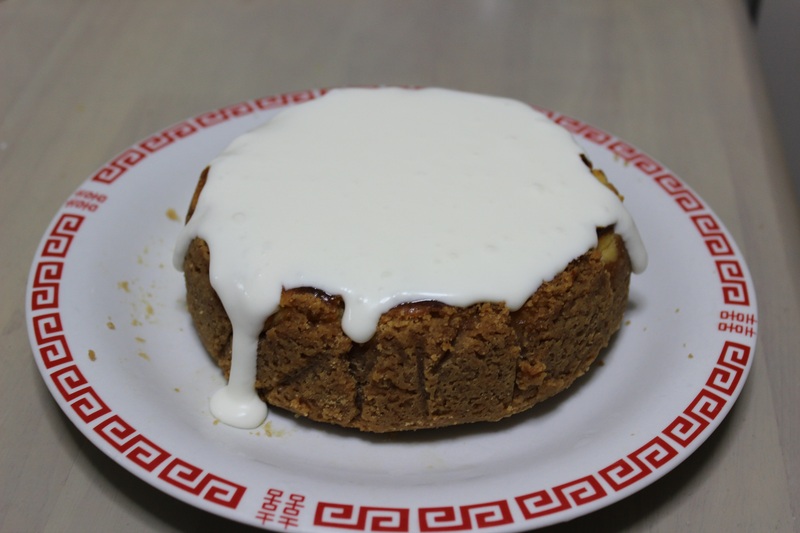 Now there are two types of yatsuhashi, baked 八つ橋 and unbaked 生八つ橋..The un-baked are those of which I am particularly fond of and are called hijiri 聖 (meaning monk or priest) or nama 生 (raw) yatsuhashi. 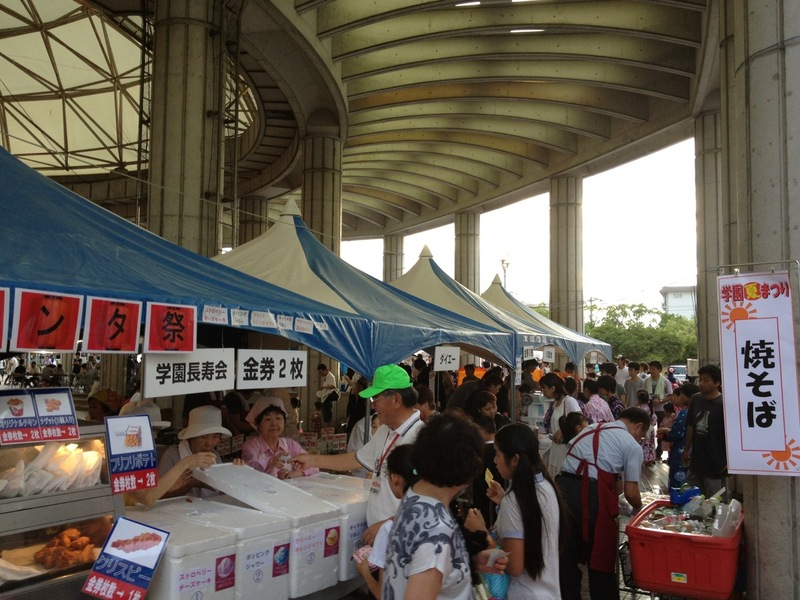 The soft hijiri/nama kind began to be sold in the 1960’s. When making this variety instead of baking the dough, it is steamed, flattened and cut into little squares. 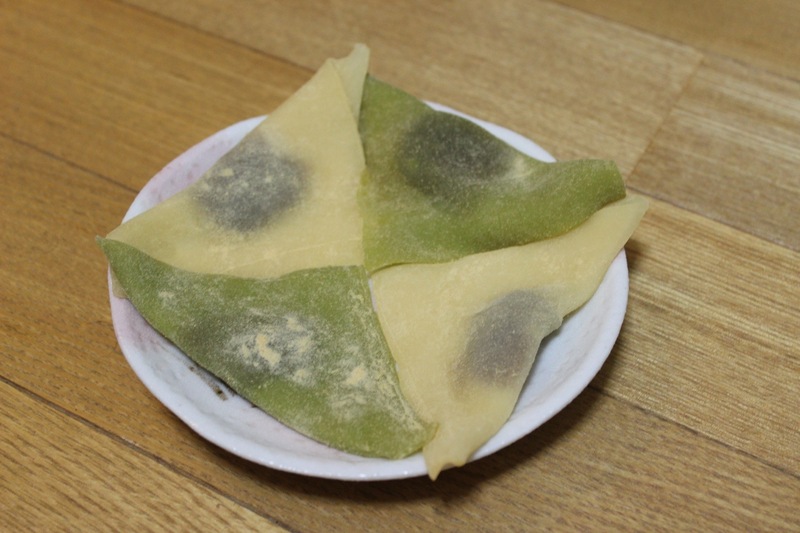 Azuki 小豆 (red bean paste) is then placed in the centre of each piece and folded into a triangle, not dissimilar to ravioli. I actually purchased this box not in Kyoto but in Osaka on my home from the Tenjin Matsuri 天神祭り last week in Sakuranomiya. Evidently I was quite ecstatic to come across yatsuhashi outside of Kyoto as its not really a place I frequent all that often, so my opportunities to nom the deliciousness that is yatsuhashi are far and wide!! If you actually look at the packaging I found the writing is a little amusing, alongside the name namayatsuhashi 生八橋 these mochi are also regionally known as O-Tabe お食べ(lit. please eat). 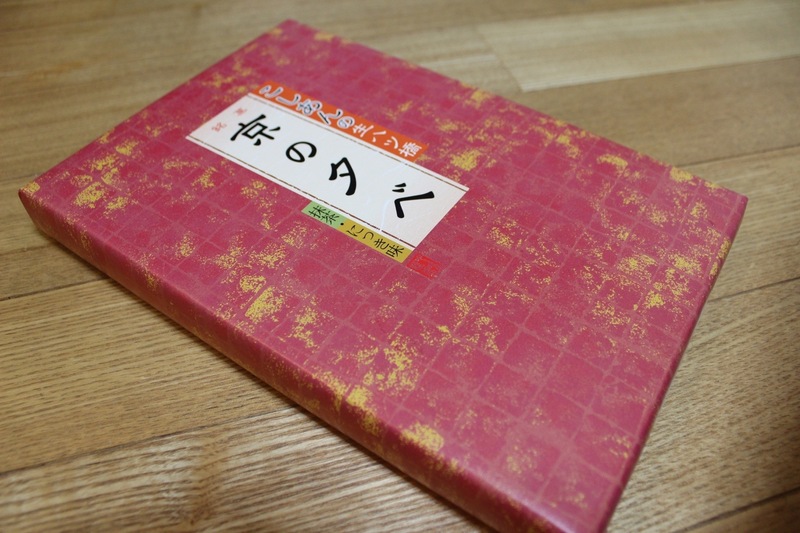 On these particular ones the name written on the box is kyounotabe 京のタベ, although this literally translates to ‘Capital Eat’ the meaning is something more akin to Kyoto Yatsuhashi. Upon opening the box I was presented with a box being half filled with lightly brown coloured triangular sweets and the other half a pale green, these correspond to the flavours which are nikkei 肉桂 (cinnamon) and matcha抹茶 (green tea), that said the centre of both consists of the same is koshian 漉し餡 (red bean paste) filling. Now these are the most standard and plainly flavoured yatsuhashi (they in fact come in dozens of seasonal and regional varieties), however they are a time and tested favourite amongst the Japanese. Having tried these sweets a decade ago when I visited Kyoto as an exchange student indulging in the soft, delicate texture complimented by the mildly sweetened koshian centre, my senses were overwhelmed and mind flooded with bitter-sweet nostalgia.